The Baker Hughes rig count showed that the U.S. rig count increased by 11 to 1010 this week. Of the rig increase, five drill for oil and six drill for gas. Since bottoming out in mid-July 2009, the gas rig count has jumped by 40. The rig count in the Haynesville area of E. Texas and N. Louisiana, which includes other formations, increased by eight to 145. Both Texas and Louisiana saw four rig increases. I started thinking the other day about the changes in the Haynesville rig count versus the national rig count. I wanted to see how they've changed relative to each other. I took a crack at a comparison, below. I used the north Louisiana rig count as a proxy for the Haynesville Play since the Texas figures include lots of other fields. 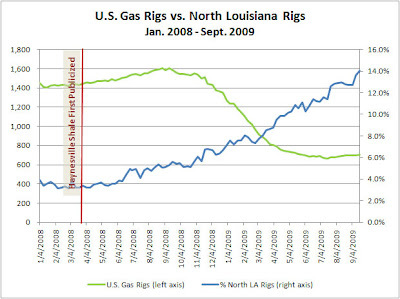 The green line is the U.S. gas rig count, and the blue line is the percentage N. LA represents of that figure. It is not a 100% apples-to-apples comparison because the NLA rig count is inclusive of all rigs (although don't believe there are many oil rigs are drilling in N. LA) and the green line is just gas rigs. Nevertheless, it gives some indication that since the Haynesville Shale was first publicized in March 2008, the N. LA rig count has risen steadily while the national count has dropped in response to economic conditions and plummeting gas prices. It also gives a good indication why national production has not fallen as much as expected with the significant drop in rig count.